Slap a "Big High 5" as some of the continent`s most sought-after performers get their act together for another comedy spectacular. 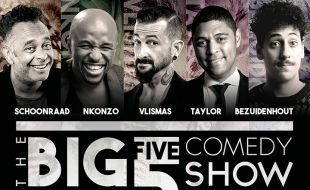 If your stomach muscles are up to it, do not miss this year`s Big 5 Comedy Show with a new line-up of exceptional talent that will add tang, spice and new angles to the Big 5 family. Soak up the laughs when Stuart Taylor, John Vlismas, Schalk Bezuidenhout, Tats Nkonzo and Kurt Schoonraad take to the stage with plenty of fresh quips in their comedy arsenal. Big 5 Comedy’s resident scratch boss and legend, DJ Ready D, also returns to use his award-winning skills to create an electric atmosphere. But be warned – he may just having you dancing in the aisles!